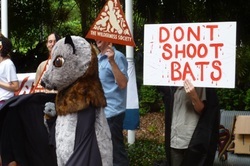 Below, we have reproduced just a sample from the hundreds of comments received through the feedback forms and (mostly) from the online "Don't Shoot Bats" petition. Clearly, many people in Queensland and beyond have a love and respect for our natural environment. Every one is a genuine, verified submission. A large number of these comments came from regional and rural areas of Qld.